Sinn Fein yesterday blamed an error for what appeared to be another extraordinary flip-flop on whether it supports a full public inquiry in the RHI scandal. Last night the party said that a “typo” had been responsible for party chairman Declan Kearney yesterday stating – both in an article for Sinn Fein newspaper An Phoblacht and a press release issued by the party – that he supported a “comprehensive, independent public inquiry”. The South Antrim MLA’s statement was withdrawn less than two hours after being issued and a replacement statement then put out which did not contain the words “public inquiry”. Then, with no explanation, late last night Mr Kearney re-released the original statement calling for a public inquiry. Emailing it to the News Letter (and seemingly others) from his personal email address rather than via the Sinn Fein press office at 11.40pm, the South Antrim MLA added the words: “Please share this important information widely”. The form which the investigation into the Renewable Heat Incentive debacle will take has now become the key political debate, with the two Executive parties – the DUP and Sinn Fein – opposing a public inquiry, while the Opposition parties and former DUP minister Jonathan Bell say that anything less will not be able to get to the truth. A full public inquiry would be the most rigorous investigation into the affair, with the power to compel witnesses and documents. Because it would be so thorough, it would be more expensive than a more cursory process and would involve a longer timeframe, arguments which at the weekend Sinn Fein used to justify its opposition to such a process. Sinn Fein is instead calling for an ‘independent investigation’ – which presumably would sit behind closed doors and would not be able to force any of those abusing the RHI scheme to come before investigators – overseen by a foreign judicial figure. Sinn Fein’s position on an inquiry has gone through numerous iterations over the last fortnight, with senior figures right up to deputy leader Mary Lou McDonald calling for a public inquiry, while others – most notably, Martin McGuinness – have wanted a much less rigorous process to be put in place. *** January 2, 11.40pm: Declan Kearney released his initial statement, calling for a public inquiry, via his own email. Sinn Fein’s stance is particularly unusual as it has been more enthusiastic than any other local party in calling for public inquiries into all sorts of other matters, including plans for a gold mine in Co Tyrone, a former detective who gathered intelligence on environmental groups and a repeat of its longstanding call for a public inquiry into the murder of solicitor Pat Finucane. In what had the appearance of a tough statement yesterday, Mr Kearney said that the “growing political crisis brought about by the RHI scandal” meant that “the DUP leader should step aside from the first minister’s office to allow a time-framed, comprehensive, independent public inquiry, led by an international jurist”. However, two hours later a statement was issued by the Sinn Fein press office saying that the previous statement had been withdrawn. The new choice of words was identical to the initial 436-word statement, with the exception of one change – “public inquiry” had been deleted and “investigation” inserted in its place. When asked about the change, Sinn Fein told the Press Association that it had been made due to a “typo”. SDLP MLA Patsy McGlone said that Sinn Fein was “in complete disarray” about how to respond to “the biggest financial scandal in the history of devolution”. 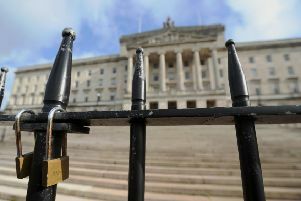 He added: “They rolled over on their threat of ‘grave consequences’ should the first minister not resign her position. “They are in the middle of rolling over on the need for an independent inquiry into this shambles. “Today we saw their party chairperson attempt a U-turn in the space of a couple of hours with a revised statement. Mary Lou McDonald has yet to correct her call for a full independent inquiry to align herself with Northern Sinn Féin’s latest media strategy. Tonight Sinn Fein will face a public test of its position on an inquiry into the RHI debacle when a motion calling for a full public inquiry under the Inquiries Act comes before Belfast City Council. One Sinn Fein councillor who will have the chance to vote on the motion – JJ Magee – said just two days ago that he does support a public inquiry. The motion – which calls for the council to “write to the secretary of state asking for him to initiate a full public inquiry into the Renewable Heat Incentive scheme, pursuant to his powers of discretion under Section 1 of the Inquires Act 2005” – has been brought by independent unionist councillor Ruth Patterson. She said: “It is clear to me that there is a great unwillingness on the part of the DUP to go down the road of a full public inquiry. However, on Sunday the Sinn Fein group leader on the council, Jim McVeigh, said that the party would be seeking to amend the motion, seemingly to remove the call for a public inquiry and instead call for “an independent, time-framed, robust and transparent investigation” which would take no more than three months.